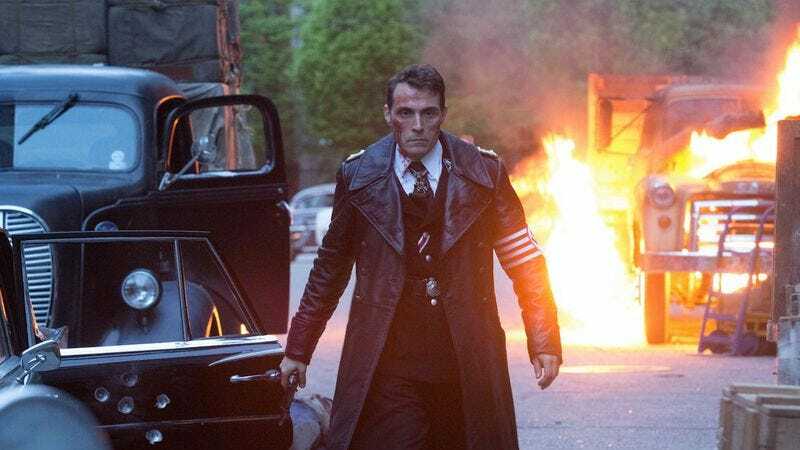 The Amazon series, The Man In The High Castle, is set in a dark, alternate reality/past in which the Axis powers defeated the Allies, creating a Nazi-occupied America. It seems the studio’s marketing department got a little carried away in promoting that scenario recently, as it included Nazi insignias in its ads on New York City subway cars. Gothamist reports that the dubious promos, which are being shared online by MTA riders, feature a modified Iron Cross in place of the stars in the American flag. The vinyl wraps, which also include an altered Rising Sun emblem representing Imperial Japan, have been placed on the benches inside of train cars. If you’re wondering how these ads with Nazi-inspired imagery could be less objectionable than ads promoting raising the minimum wage, it’s reportedly part of the MTA’s decision to steer clear of any political messaging. MTA spokesperson Adam Lisberg told Gothamist that the ads aren’t in violation of the transit authority’s ban on political ads: “Unless you’re saying that you believe Amazon is advocating for a Nazi takeover of the United States, then it meets the standards.” So, because the threat of fascism is presumably less imminent or politically charged than that of a standardized living wage, MTA riders will have these questionable ads against their backs until December 14. Amazon has yet to comment on the matter, possibly because it’s looking into how things turned out for those Mr. Robot ads. But its Man In The High Castle campaign is just the latest botched attempt at “authenticity in viral marketing”—remember how the producers of Homeland unwittingly included a “Homeland is racist” message in one of its recent episodes?